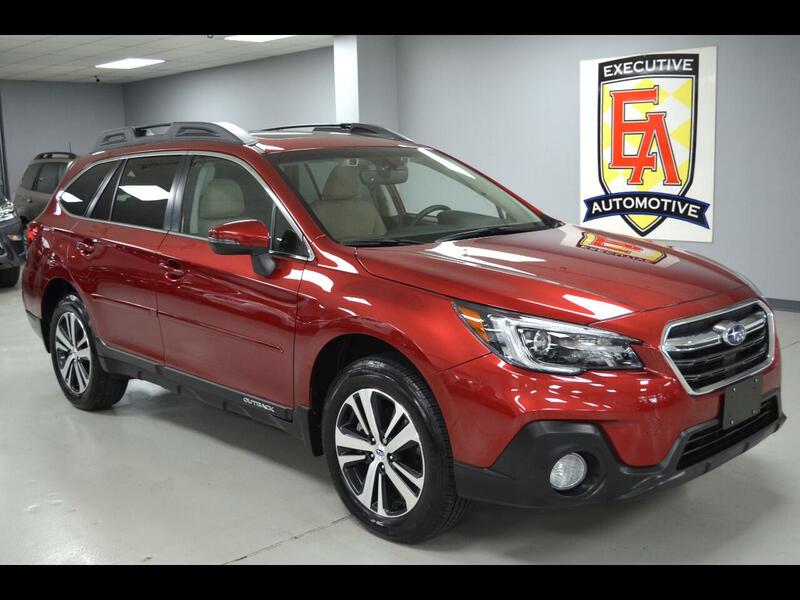 2018 Subaru Outback Limited AWD, Crimson Red Pearl with Warm Ivory Leather. Options Include: EyeSight Driver-Assist System with Pre-Collision Braking System, Pre-Collision Throttle Management System, Lane Departure Warning and Lane Sway Warning, Adaptive Cruise Control, Lane Keep Assist, Reverse Automatic Breaking System, Parking Sensors, X Mode, Navigation System with 8" Mutimedia Display, High Beam Assist, LED Steering Responsive Headlights, Splash Guards, Rear Seat Back Protector, LED Map and Dome Lights, Rear Bumper Cover, All Weather Floor Liners, Auto Dimming Side View Mirrors, Body Side Molding, Back-Up Camera, Power Tilt/Sliding Moonroof, Harman Kardon Audio, Bluetooth Connection, CD Player, Steering Wheel Audio Controls, USB/Aux Inputs, Dual Zone A/C, Keyless Entry, Push Button Start, Heated Front and Rear Seats, 18" Alloys, Fog Lights, Turn Signal Mirrors, Rear Spoiler, Memory Driver Seat, Driver Lumbar Support, Paddle Shift, Universal Garage Door Opener, Power Windows, Power Locks, Power Mirrors, Power Seats, Power Liftgate and more! Contact Kyle Porter at 816-616-2500 or email: kyle@executiveautomotive.com for additional information. Thanks for your interest in our Outback!